The chief executive of Safr, a Boston ride-hailing service focused on women’s safety, was arrested last week on a fugitive from justice warrant out of the Virgin Islands, where he is wanted on charges he defrauded the government of more than $2 million. Syed Zain Gilani, 43, was arrested in his company’s headquarters at 68 Harrison Ave. in Boston around 12:15 p.m. Friday by members of the Boston Police Fugitive Unit and the US Marshals Service. He agreed to rendition to the Virgin Islands, according to court documents. “It’s got nothing to do with Safr whatsoever. That I can say categorically,” said Gilani’s attorney, Eoin Beirne, on Tuesday. The charges stem from a scheme that Virgin Islands Department of Justice officials say Gilani ran with two other men, in which they pretended to implement federally mandated updates to identification cards, such as licenses, for three years while pocketing grant money. Another new change? 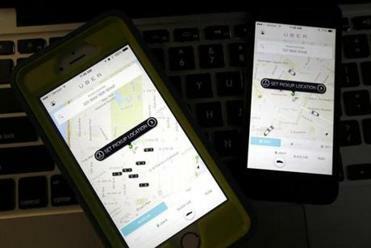 Riders will be charged by the minute if they keep an Uber car waiting for more than two minutes. Gilani was not notified of the arrest warrant that was issued for him in the Virgin Islands last week, Beirne said, or he would have willingly returned to the islands instead of being arrested in Boston. Gilani is the CEO of Safr, which debuted in Boston in March. The company was formed after a spate of sexual harassment and assault complaints from female passengers who were using Uber, another popular ride-hailing service, according to media reports about Safr’s launch. Safr trains its drivers, many of whom are women, in safety and bystander awareness, and allows riders to select the gender they prefer to ride with. The service comes with an SOS button so that riders who feel unsafe can contact 911 or a predetermined emergency contact. Beirne said Gilani has no criminal record. His children were born in the Virgin Islands, and he lived there for several years. He ran a business there called BizVI, Beirne said, which sold features of the federal government’s REAL ID program to the government of the Virgin Islands. The REAL ID program was established after Congress in 2005 passed the REAL ID Act, which set new standards for state-issued identification cards and driver’s licenses. Prosecutors in the Virgin Islands say that Gilani, his company, and the two other men also charged never did any real work for the program. Jerris Browne, the former director of the Bureau of Motor Vehicles, and Gregory Christian, the bureau’s former project coordinator, were arrested Thursday in St. Croix in connection with the scheme, she said. All three men face one charge each of obtaining money by false pretense, conversion of government property, embezzlement by public officer, filing false instruments, falsification of public accounts, fraudulent claims upon the government, false certificate by public officers, and criminal influenced and corrupt organizations conspiracy, according to a press release. In September 2008, said Corliss Smithen, public media officer for the Department of Justice in the Virgin Islands, Browne allegedly submitted an application to the Department of Homeland Security requesting funding for the REAL ID program, which was approved for $2 million. The money was disbursed between 2008 and 2011, according to prosecutors, but Gilani, Browne, and Christian never implemented the program. The motor vehicle bureau was supposed to put the contract out to bid, she said. But instead of procuring bids from independent, competitive companies, Smithen said, Browne contracted with three businesses that were all owned by Gilani. The Virgin Islands complaint alleges that Browne and Christian then certified that the work was performed by the companies — even though, officials allege, nothing had been done. The alleged malfeasance was not discovered until 2015, according to the press release, when the current Bureau of Motor Vehicles director discovered that the bureau did not have the functional software application to carry out the mandates of the REAL ID program. Gilani is to be picked up for transport to the Virgin Islands on July 7. Smithen said he will be arraigned in Virgin Islands Superior Court on St. Croix.